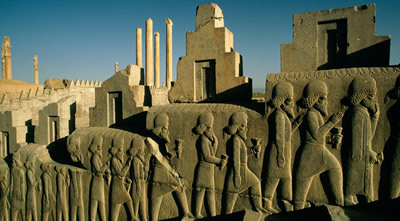 The Persians (or Parsu) were a grouping of Indo-Europeans who settled to the east of ancient Elam during the period of instability and migration which occurred throughout the Middle East between 1200-900 BC, when other tribal groups such as the Aramaeans and theSea Peoples were causing chaos further west. The Persians drifted in from the east, probably via Sogdiana and Transoxiana, not long after similar groups had entered India, and the mythical early kings seem to rule either in these areas or in parts of eastern Iran. Cyrus (Kourosh in Persian; Kouros in Greek) is regarded as one of the most outstanding figures in history. His success in creating and maintaining the Achaemenian Empire was the result of an intelligent blending of diplomatic and military skills and his rule was tempered with wisdom and tact. Cyrus the Great - Persians called him 'father'; the Greeks, whom he conquered, saw him as 'a worthy ruler and lawgiver' and the Jews regarded him as 'the Lord's anointed'. arabian odyssey - Arabia , Southern Africa and the Indian Ocean .